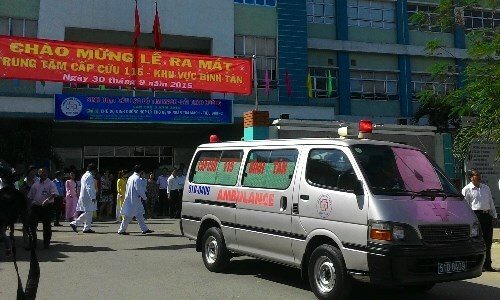 The Ho Chi Minh City Health Department inaugurated an additional first aid centre at the Binh Tan General Hospital in the city on September 30. According to Deputy Director of the Ho Chi Minh City Emergency Centre 115 Vo Quang Huy, the Binh Tan hospital offers all specialties and is capable of performing nearly all techniques in emergency aid and treatment; the new centre will help meet the outpatient demand of local residents and other vicinities. The centre will coordinate with Binh Tan hospital in arranging personnel after receiving calls from the 115 toll number. The first aid team will include doctors, nurses, drivers and specialised emergency vehicles which are fully equipped with first aid gear. Binh Tan district is home to five major industrial parks and the area often has serious traffic accidents. The establishment of the centre in the region is expected to complete the city’s emergency aid system. The Ho Chi Minh City’s Emergency Centre 115 was founded in 2014. The centre in Binh Tan is the second, after the first opened within the Saigon General Hospital.